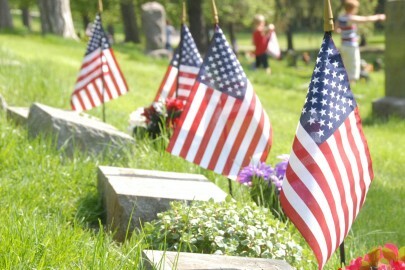 To those who courageously gave their lives . . . And those who bravely fight today . . . THANK YOU!! Each year, a few days prior to Memorial Day, we gather together and place flags on the graves of Veterans at Hillside cemetery. Photos: We are thrilled to have so much help from scout groups and others in the community. View some of our photos. Want to join us? For more information on the date and time for this year, look on our events page. Raffle Tickets are available for this year’s quilt! "Fasting and prayer were Lent's spiritual disciplines. How about a Resurrection Recount for Eastertide? In the 50 days ahead, let's take time to recount the God's deeds in our lives." Read more of today's Daily devotional by Talitha Arnold. Kenneth L. Samuel No rejection is indicative of our divine destiny. The power of the resurrection is the power to step outside the molds of safe assimilation to be the authentic presence God created us to be. Mary Luti We hold our breath and wait: "For the world now groaning, is there life? Is there life for you, Holy One?" Quinn G. Caldwell Some of us look away from Good Friday violence because we're too pampered to handle it. Some of us look away because we're tired of seeing it every day on the streets and in our homes. Are we willing to witness?